For Federal funding to be authorized for the construction of Major Projects, the Project Sponsor must demonstrate to the FHWA that the project has been carefully planned out, i.e., costs have been estimated as accurately as possible; risks have been carefully considered and mitigated; funding requirements and strategies have been clearly defined; and project roles, responsibilities, and processes have been identified. The timeline shown below identifies the milestones for the three requirements as part of the overall project delivery process as it extends from planning to final design to construction for major projects regardless of contracting method. 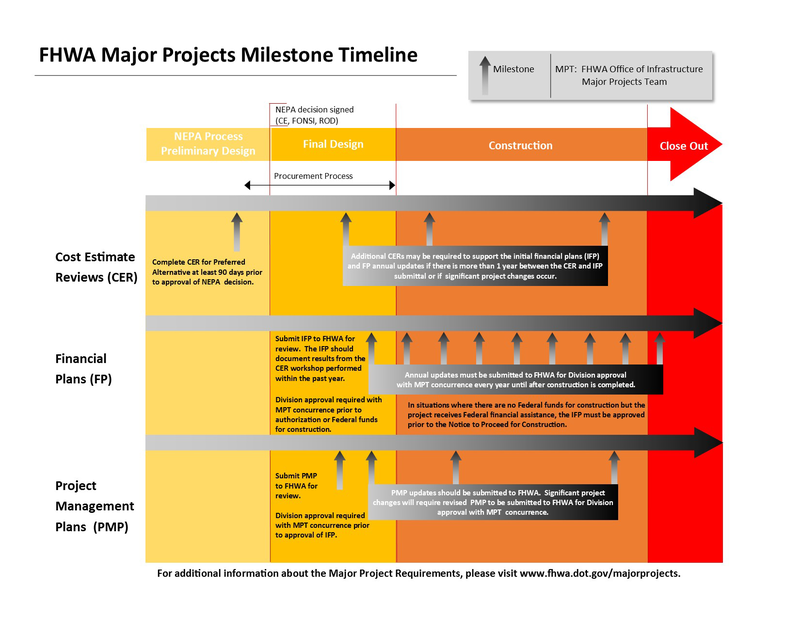 This timeline depicts the sequence of the major milestones for the three FHWA requirements - Cost Estimate Review, Financial Plan and Project Management Plan - throughout the entire project delivery process, as it extends from planning to final design to construction. During the NEPA process, the Cost Estimate Review for the project should be conducted. It is generally recommended that this review be conducted at least 90 days prior to the approval of the NEPA decision. As the project heads into the final design phase upon the completion of the NEPA process, there are two major action items required from the Project Owner. The first is the submittal of the Project Management Plan prior to the approval of the Initial Financial Plan. The second requirement is the submittal of the Initial Financial Plan prior to the FHWA authorization of funds for construction. In some cases, additional Cost Estimate Reviews may be conducted to support the approval of the Initial Financial Plan if there is more than one year between the Cost Estimate Review conducted during the NEPA process of if significant project changes have occurred during final design. Once construction begins, the Project Owner is required to submit annual updates to the Financial Plan until construction is completed. Additional Cost Estimate Reviews may be required to support the annual updates to the Financial Plan if significant project changes occur. Updates to the Project Management Plan are also required if any significant changes occur to the project during construction.